Yes. It is true our baby is walking. 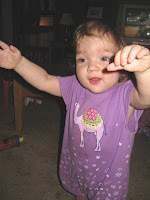 I can hardly believe she is old enough to roll over let alone toddle around the house! Now these are very tentative steps we are talking about here, never more than like ten to twelve at a time. As you can see by the balance check pics most end up on the bum, but she keeps on truckin'. We are so proud. What a cutie. Her little legs are so pudgy still that there is some waddling to that toddle but all the better. Way to go Addy! The cousins came for a surprise visit! The cousins came for a surprise visit to Washington last weekend and got to play together and had lots of fun. They tried out Addy's new birthday toys and Delaney's power wheels Jeep. The toy that was most sought after though was Delaney's new Dirt Devil vacuum. All 4 kids wanted to play with it at once! It was sure great to see them and we are very glad they stopped by to visit. On their way back the even bigger surprise was that they brought Uncle Jerrod with them! Jon was very excited and happy to his brother. We can't to see them all again real soon! 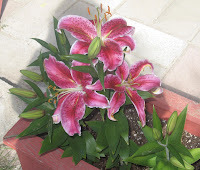 Jon planted Stargazer Lily bulbs that he wasn't sure if they were going to bloom or not and surprise! They have been blooming this past week and they are gorgeous. He is so sweet because he says he planted them as a declaration of love for me. He used to get these for me in arrangements when we first dating and I fell in love with them as I fell in love with him. I appreciate the gesture so much because it is the little things like this that always remind why we belong together. I love you Jon! 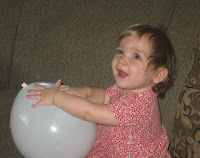 We had Adelyn's 1st birthday party on Saturday at our house. She was not in her best of moods due to being a little overwhelmed by the all the people but she had a good time. She got lots of goodies from her family and her very own mini birthday cake. Her Grandma Cathy made an awesome orange and pink crown shaped cake for everyone else. Surprisingly Addy wasn't that big of a fan of the whole cake thing. Her favorite thing was when I filled her room with balloons and let her chase them around and pounce on them, it was so funny! The biggest birthday surprise of all was that she started walking the next day! It's so exciting, she has been trying for a while and then boom she just took off! We want to say thank you so much to everyone who came to Adelyn's party and helped make it the special day that it was and I am sure we will always remember it. 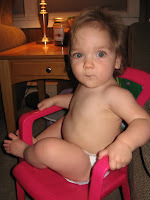 Adelyn's latest feat is that she can climb up on and sit in her big sister's chair. The trick and funny part is of course that she can't get down! Her hair has gotten longer lately and Daddy likes to call her his little Farrah. We just can't believe she is already going to be one. It seems on some days like I just had her, and then well there's most of the other days where she seems like just one of the fam who's always been here causing trouble!